After the devastating earthquake and tsunami and now the fear of a terrible nuclear meltdown, my husband Carlos was creatively inspired to create this beautiful (yet sad) poster to promote awareness into giving help to Japan. I am aware of a few donation sites out there in cyberspace, but not too sure of their credibility. So please be careful where you make your donations. I took this directly from a site where Carlos has shared his poster. A bit of a segue this week from iPhoneography. 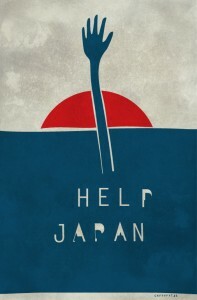 I’ve designed a poster to help raise funds for the relief efforts going on now in Japan. I had spent some time Friday sketching – took a break and continued yesterday – or wait -Sunday – it’s already Tuesday – aye. So I finished it up and modified my site a bit to facilitate the purchase of this poster – All proceeds from the sale of this poster will go to help the people in Japan. Here is a link to his site. All of the proceeds of the sale of his poster will go to Global Giving Japan Earthquake and Tsunami Relief fund. You can also make a donation on the site also. Thanks for helping!